Theatre professor Bruce Cromer adapted Charles Dickens' classic novel and is directing the world premiere production himself. Fifteen actors will play more than 30 characters in Wright State’s world premiere production of Barnaby Rudge: Part 2, 1780. 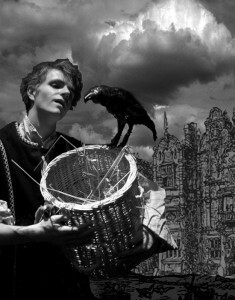 The theatre department presented the first half of this Charles Dickens’ adaptation last spring. The play will be performed for one weekend only on June 1 and 2 at 8 p.m. and June 2 and 3 at 2 p.m. in the Herbst Theatre. Set in and around 18th century London, Barnaby Rudge tells the story of a simple-minded young man and his mother who are endangered by a mysterious stranger. An unsolved murder from the past pulls four young lovers from four families into a plot of deception, danger and desire. Bruce Cromer adapted the novel for the stage and is directing the production himself. “It is the magic combination of Dickens and theatre that we’ve attempted to offer in this new Barnaby Rudge—and that we’ve been happily playing with for the past months,” said Cromer. Cromer, a professor of acting and movement, is the department’s area coordinator of acting. He is also a resident artist with the Human Race Theatre Company, a fight choreography expert and a certified teacher with the Society of American Fight Directors. The Herbst is a small, black-box theatre located in Wright State’s Creative Arts Center. The venue offers audiences an intimate theatrical experience without the distractions of large crowds or elaborate stage décor. Tickets are $7 for students and $10 for adults. They go on sale 90 minutes prior to each performance at the Theatre Box Office. Seating in the Herbst is limited, so patrons are encouraged to arrive early. For more information, call (937) 775-2500. Did you miss last year’s production of Barnaby Rudge: Part I, 1175? You can watch the production on YouTube at http://www.youtube.com/OxyshjvUBtk.